640132 Features: -Advanced chemistry set.-Plus dozens of additional tools and chemicals, and 100 additional experiments.-Similar hands-on approach to teaching chemistry as our other Chem kits.-Teaches more advanced topics such as chemical equations, atomic structures, and the periodic table.-Concepts are critical to continued study of chemistry.-Excellent preparation for high-school level chemistry.-92 Pages.-Ages 12 and up. Includes: -Includes all of the components from Chem C2000. Color/Finish: -Full-color experiment manual is written at a more advanced level than the other Chem kit manuals. This kit includes all of the components from CHEM C2000, plus dozens of additional tools and chemicals. 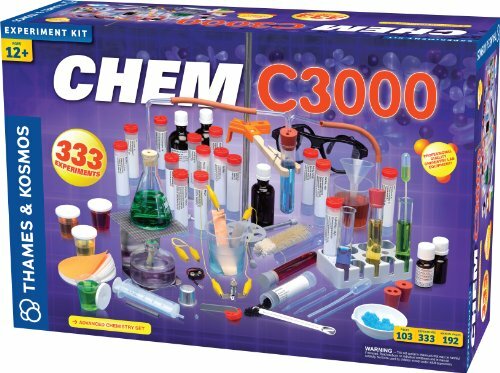 CHEM C3000 is an excellent preparation for high-school level chemistry. If you have any questions about this product by Thames & Kosmos, contact us by completing and submitting the form below. If you are looking for a specif part number, please include it with your message.